Unless you’ve avoided all news over the past year or so, you’ll have heard about the upcoming United Nations Framework Convention on Climate Change in Copenhagen, which starts on the 7th December and runs through to the 18th December. 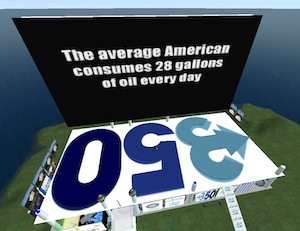 OneClimate, auspiced by Non-profit organisation OneCLimate, has created Virtual Copenhagen a large exhibition space in Second Life. Aside from the numerous exhibitions (some are listed below), the presence will be streaming content from Copenhagen plenary sessions, press conferences and “voices from the global south that might not otherwise be heard”. Aside from the streaming aspect, those attending in Second Life will have the opportunity to put questions to people being interviewed by the broadcasters in Copenhagen. I spent half an hour walking around the exhibits and there’s certainly plenty of interesting information to be digested. There are some exhibition spaces remaining (contact Coughdrop Littlething in-world if you’re interested). 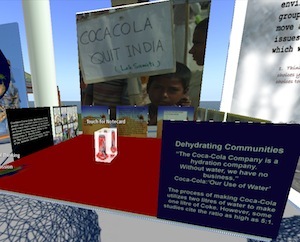 For more details on the Second Life activities, teleport there yourself or check the OneClimate website. Beta Business Park, HeatSaver Energy Systems Inc, SmarterEarth (working in with the University of Iowa), Commonwealth Islands, NOAA, Virtual Native Lands, V-Innovate, European Metaverse Association, Public Policy Virginia, L’Ultimatum Climatique, Better World – Center for Water Studies, Human Mosaic Systems, The Institute for Sustainable Communication, Four Bridges, Peace Train, Etopia, ViO, State of the World Forum and The Transition Network. Once the real-workd discussions fire up in December, it’ll be interesting to see what impact the Second Life aspect will play. Virtual Copenhagen is certainly well resourced and organised: whether it can cut through the enormous level of activity that’ll be occurring remains to be seen, but OneClimate certainly won’t die wondering with their efforts.